Here are various musical projects that have come about since Thompsound Music started back in 1999. 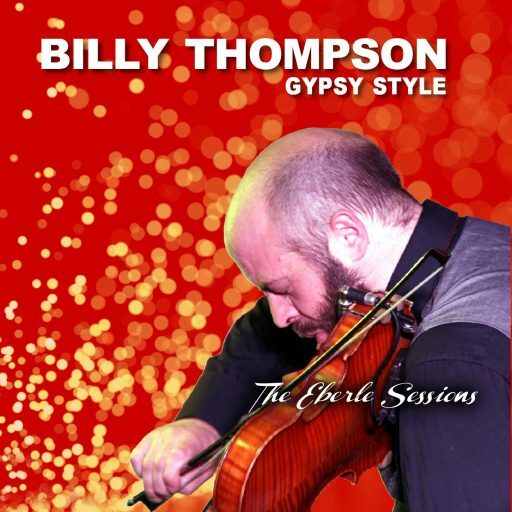 Billy Thompson Gypsy Style – The Eberle Sessions is the full studio album by Billy Thompson Gypsy Style and is the latest recording to date from Thompsound Music. This album features Billy Thompson (violin), Karen Street (accordion), Andy Mackenzie (guitar), Eryl Jones (guitar/mandolin) and Greg Robley (bass). The album also features special guest appearances by Ivor Aldred on Harmonica for Bluesy Isaac and also John Wheatcroft on Guitar for Teigr Lily, Jeff Beck’s Scatterbrain and Django’s Micro. ‘Taith’ (‘Journey’) is a collection of spiritual songs, a new project by Cass Meurig reflecting on her personal journey over the last few years. Buckling Point by Gavin Crisfield is an album of original songs reflecting his life and times. 2011 saw the long awaited release of Dave Elwyn’s debut album Raw Blues. Mixed and Mastered at Thompsound Music, much of this album was also Recorded at Thompsound Music including the string section to Know it All. Chris Hayward (violin), Andy Mackenzie (guitar) and Greg Robley (bass) make up the Gadjo Jazz Trio. This album was recorded at Chris’s conservatory overlooking Porthmadog harbour. This allowed the band to record in the same space they used to rehearse in capturing the room’s acoustics as well as the group’s suitably inspired performance. Tango 5 Live is a live recording of the concert given by Tango 5 at Sheffield Town Hall in 2009. The recording was a live performance by Tango 5 who are exemplary exponents of the music of Astor Piazzola. Dave Routledge (violin), Santiago Cimadevilla (bandoneum), Peter Lawson (piano), Tom McKinney (electric guitar) and James Manson (double bass). Billy Thompson Gypsy Style LIVE is a live recording of the concert by Billy Thompson Gypsy Style at the Llay British Legion April 7th, 2009. This CD features Andy MacKenzie on lead and rhythm guitar, the rhythm of Eryl Jones (guitar/mandolin), Phil Gardiner (guitar) and Dave Turner (double bass). Amledd’s album was the culmination of about 3 years of songwriting by Billy Thompson and Rhian Williams (later to become Billy’s wife). Released in July 2006, ‘Cyfnod Cyntaf’ (which translates as ‘first phase’) is an album of totally original songs that has been described as ‘modern folk’. ‘…Throughout, Thompson’s violin is sharp and strong. At times he fiddles as fast as a whirling dervish, seemingly a one man orchestra, yet more he comes on like a lead axe player with chords and runs as big as er… Snowdon. It’s the combination of his smart melodies and her [Rhian Williams’] canny vocal that makes this one of the smartest indie rock based projects to come calling in a while.’ – The Chester Chronicle. Pronounced with the DD sounding like the TH from the word ‘The’. Amledd is the Welsh for the English word ‘frequency’. Billy’s first major project after setting up Thompsound Music was the 2002 album ‘Ysbryd Solva’ by Meic Stevens and band for Sain Records. An unforgettable (and learning) experience for all involved. This album includes many of Meic Stevens’ classic songs and opens with the haunting Ysbryd Solva – listen out for Billy Thompson’s seagulls. This album is representative of the sound Meic Stevens, Heather Jones, Dave Reid and Billy Thompson were performing live at the time. Billy Thompson (in the centre of this photo) performed with this Welsh singer/songwriter for 10 years between 1997 and 2007 playing at every major festival in Wales along with numerous television appearances and 5 albums. There is an album by a wonderful songer/songwriter by the name of Gavin Crisfield – watch this space. There is also the long awaited album by Eryl Jones on its way. And also, the live looping project of Billy Thompson and Warren Greveson – Dolennu. Cass Meurig recorded her Crwth (a six-stringed medieval bowed lyre) parts to Cerys Matthews‘ folk album Hullabaloo here.